No, you didn’t see that wrong. Eyewitnesses are notoriously unreliable, because memories are notoriously unreliable, but the thing about eyewitnesses is that they witness things once. You can witness this as many times as you want. Loop it over and over and over again. This pitch. It went for a dinger. Lowest one yet. You see an elevated blob up there, but the homers in the lower areas are sparse. 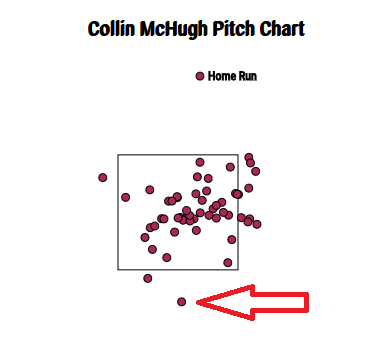 I looked up all of McHugh’s career two-strike curveballs thrown way down below the zone. Unsurprisingly, most of them were taken for balls. There were 35% swings. Of those swings, 68% missed. There have been four times as many whiffs as batted balls. In case it’s not clear, McHugh did what he wanted to. That pitch had nearly never failed. Then came the Mike Trout Override. Daren Willman tweeted something after the fact. It’s since been picked up in a handful of articles. Willman noted that Trout’s homer was the lowest pitch hit out since Freddy Galvis drilled a lower pitch in April 2013. It’s true! It’s been more than three years since we’ve seen a lower pitch turned into a homer. Yet we can turn this into something even more impressive. Trout is a pretty big dude, right? Galvis, not so much. Galvis isn’t short, but it’s worth remembering that pitch heights are always relative. The pitch Galvis hit out was 7.7 inches below the lower boundary of his strike zone. 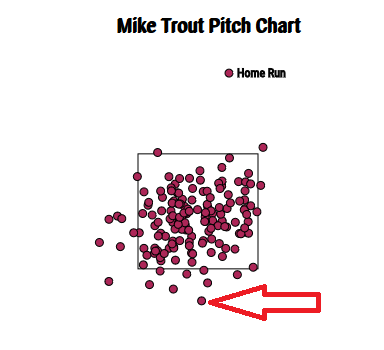 The pitch Trout just hit out was 9.1 inches below the lower boundary of his strike zone. If I’ve done my analysis correctly, then in these terms, Trout’s homer came against the lowest pitch — relatively speaking — in the PITCHf/x era. It just narrowly edges out a homer by Delmon Young. All the measurements have margins of error, so we can’t pretend it’s all perfect, but Trout did something extraordinarily rare. It’s kind of his thing. 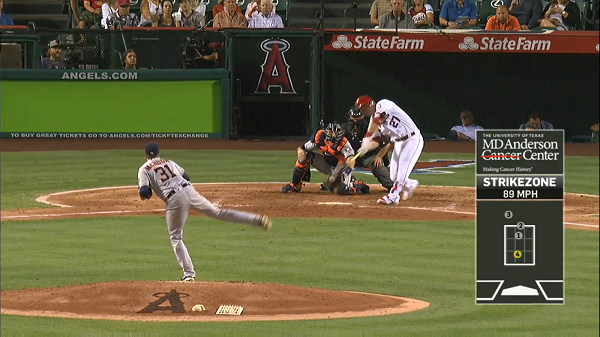 Stepping just a little back, Trout walloped a two-strike curveball. For that matter, it was a good two-strike curveball, and I noticed that, when Trout came up to bat the first time, McHugh didn’t show him a curve. The second time, McHugh didn’t show him a curve until the curve that flew away. Now, McHugh throws plenty of curveballs, and it’s not like Trout would’ve been taken by surprise by one, but still, this grabbed my attention. Trout was ready and waiting. And according to the numbers, he’s now feasting on curveballs more than ever. So Trout, this year, is at +10.3. Trout, for his entire career, is at +16.7. His career-best mark before was +3.9. Trout is still just 24 years old, and it makes sense that he continues to develop. His current wRC+ is right where it’s always been. Yet he has a career-low rate of strikeouts, having slashed five percentage points off last year’s mark. Mike Trout has gotten more prepared for each individual at-bat, and his success against curves shows that he’s still learning what to look for, and when. Now Trout’s approach is better, and more complete. He’s plugging holes that weren’t even that hole-y. Depending on your perspective, he’s either amazing or impossible. 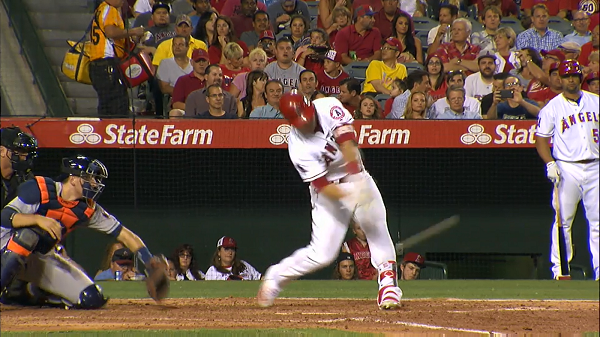 Mike Trout has become a fan of hitting curveballs. Monday, he smashed a really good curveball, one thrown right where the pitcher wanted. It was one of the lowest pitches hit out of the park that we’ve seen in recent years. It was a signature moment for an iconic young player, the sort of achievement even the other team has to stop and admire. The Angels lost. We hoped you liked reading Mike Trout Wants Your Curveballs Now by Jeff Sullivan! Damn straight he hit that bad ball out; he wears Vlad’s number #27. I mean, he probably shouldn’t try to do it, but he probably could. And he had to reach for that bomb! Damn, that’s some pop. Vladi Sr. was one of, if not the most, fun players to watch in the entire league, if Jr is half as fun, I’ll be a fan.